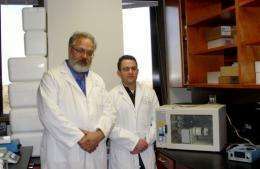 This undated image recieved February 10, 2011 courtesy of Nicholas Genovese shows the researcher (R) with biologist Vladimir Mironov in their laboratory at a Medical University of South Carolina science building in Charleston. A 21st century American cowboy will resemble a worker in an hi-tech plant creating artificial meat in a petri dish, a far cry from cattle ranches, says Mironov. A 21st century American cowboy will resemble a worker in a hi-tech plant creating artificial meat in a petri dish, a far cry from cattle ranches, says biologist Vladimir Mironov. The growth of "cultured" or in-vitro meat may be a vital step towards solving the global food crisis and fighting hunger in the future, Mironov believes. It may also be used on the first trip to Mars where it's impractical to bring a cow on a six-month mission on a space shuttle. "Think about planetary settlement, for example, or growing density of population," Mironov said. "There is already no land to grow crops in New York or Singapore." But the 56-year-old Mironov, along with fellow researcher, 32-year-old Nicholas Genovese, face many challenges in their small cutting-edge laboratory at a Medical University of South Carolina science building. The amount of meat now grown in a laboratory is one problem. T-bone steaks don't grow on trees or overnight under a microscope. But Mironov says creating a steak is not far from becoming reality. "It is a function of time. It is a function of money," Mironov said. About 10 years ago, Mironov's research dream to grow "cultured meat" became reality when he was awarded a grant from the National Aeronautics and Space Administration (NASA) for cardiovascular tissue engineering. He landed the grant with the help of Dr. Helen Lane, a top NASA food expert that Mironov invited to a workshop he hosted. But the research is no longer funded by NASA, and Mironov said he was told that NASA was moving towards researching transgenic plants as a source of protein. "Research proposals are reviewed and vetted based on many different factors," Katherine Trinidad, from NASA's public relations department, asked why Mironov's funding had not been renewed. Now Mironov, along with Genovese, are funded by a three-year grant from the animal rights activists People of Ethical Treatment of Animals (PETA). A tissue engineer by trade, he has taken embryonic muscle cells called myoblasts, which turn into muscle, from turkey, bathed them in a bovine serum and then grown animal muscle tissue. "We are working on very small scale using NASA synthecon bioreactor and porous edible chitosan spheres seeded with myoblasts from edible animals," Mironov explained. The cultured meat choice confronting tomorrow's shoppers will be similar to today's options in the meat department. One North Dakota bioengineer Douglas McFarland has grown myoblast cells from chicken, turkey, lamb, pig and cow, Mironov says. Mironov finds that liver or "famous French guts pate" is the easiest muscle meat to grow. And he says cultured meat will be "functional, natural, designed food", arguing that modified food is already common practice, and not harmful. Mironov and Genovese are two of 30 applicants who have been invited to a European Science Foundation workshop on in-vitro meat in Goteborg, Sweden in August to discuss the obstacles they all share. There is also a "yuck factor" to overcome when people know that meat is grown in a lab, although other foods like yogurt have been cultured for years. "One of the biggest things that people enjoy as a comfort thing is food," said Sam Bowen, a bar manager in Columbia, South Carolina said. "And until people grow up with the idea of artificial meat, it's going to be hard to convince people otherwise." Funding is one of the biggest hurdles. The National Institute of Food and Agriculture, among other organizations like NASA, won't fund the research. The Netherlands, on the other hand, funds in-vitro meat research for their bio-engineers, according to Mironov. "It looks like Europeans now are taking a lead in development of in-vitro meat technology," Mironov said. "But original idea was American." Mironov, though, is optimistic about future prospects. They have designs for bioreactors they foresee producing in-vitro meat in what he calls "carneries". Although Mironov and Genovese won't disclose how much cultured meat they've grown so far, they plan to unveil their product with a tasting at the August workshop in Sweden. "We are ready but venture capitalists and federal agencies are not yet," Mironov said. "But the time will come." What yuck factor? Cultured meat is cruelty-free, and there should be much less chance of infections. Only the person who hasn't seen a slaughter house can say cultured meat is yuck. That is a good point about slaughter houses, but I would still consider cultured meat as pretty yucky (I am a vegetarian btw). Whenever we try to "improve" food by making it more artificial and heavily processed, I feel we actually end up making it worse... Who needs artificial meat? Just eat the Soy, corn, wheat, oats, etc. that are mostly used to feed animals now, problem solved. I have no issue with the idea of lab grown meat, I just hope that taste won't suffer. If anything, wouldn't it be possible to produce wagyu quality beef at a fraction of the cost? I've seen a slaughter house and I guess it's a matter of perspective, but it didn't make me think "yuck". Then again, I've hunted before and have skinned, cleaned and butchered a few animals. For me the sight of every thing is easy to deal with, the sounds on the other hand. Bone cracking is not something you want to get used to hearing. I doubt that this method will be cheaper and the price here is important , at the other hand making plants to produce something like meat is much more good idea, it will be even heltier, the animal proteins are much more nutritional, and easy digestible. And about killing animals you should watch earthlings, it is horrible!